I have several types of lavender in my garden in Sicily that I think of as “the survivors”- the ones that stoically shiver through the winter frosts, and then refuse to keel over and die under the brutal August sun. Usually my lavandula stoechas, commonly known as French Lavender, is in full bloom in May. I am sure of this because there is a wonderful period in May when the roses are in bloom along with the lavender, and this glorious period makes me forget all the hell and sweat it took to get there. 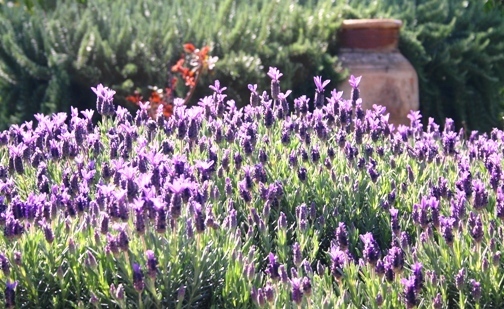 This year, the French Lavender started blooming in February, and today (March 11), it is in full bloom. Perhaps this is because we had such a wet winter, but then why did the nursery tell me to water it sparingly? Anyone else have this experience? Or maybe I should stop asking questions and just enjoy it! I intend to cut off the old blooms (tedious work) in hopes that it will bloom again in May, but more likely, when my hands get cramped I’ll just heartlessly prune the whole thing and hope it blooms again this spring. I will not bore you with the details of my many attempts at trying to understand how best to care for this rather fickle variety of lavender, but when it does bloom, it’s bellissimo. Hey there would you mind sharing which blog platform you’re using? I’m planning to start my own blog soon but I’m having a tough time selecting between BlogEngine/Wordpress/B2evolution and Drupal. The reason I ask is because your design and style seems different then most blogs and I’m looking for something unique. P.S My apologies for getting off-topic but I had to ask! I use wordpress, with a custom template. Good luck blogging!